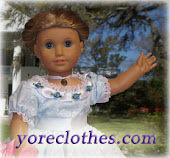 Have you bought a dress from 'Doll Clothes of Yore', and can't find the information? Well, I have always regretted that I could not have the individual dress information on my website permanently, so it could always be accessed by anyone who wanted it. Well, I have finally be able to set up the 'Archives' section - It is a page with a series of tabs organized by time period. The tables contain links to PDF documents that can easily be opened and printed or saved to your computer for future reference. The information is free for personal use, but please be aware that the images are copyrighted. Note: the PDF's may not display correctly in an older browser, however, if you save them to your desktop, they will display correctly and will also print correctly. Click Here to check out our 'Archives' Section! Every month of 2013 there will be a special featured dress. 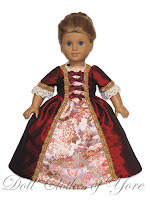 Since January's birthstone is Garnet, a deep red gem, January's featured dress is a deep red as well. The 'Montagu' Dress is named after Elizabeth Montagu, an 18th-Century literary patron and social reformer. 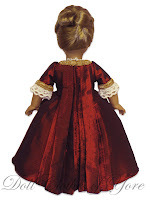 I have wanted to make a 'sacque-back' gown for Doll Clothes of Yore for some time. It's quite a challenge since the dolls are small, and I need to be able to mass-produce these dresses. I was able to draft my pattern, and I now have the finished product! I am happy with how it turned out, and I hope you are too! There are only 8 of these dresses available, so don't hesitate! Have a happy January!